We need your landline number. If the socket is not damaged, you have the option to transfer this to us at no cost. Install a new line at my property (£29.99 will be required today to do this). There’s no commitment to buy at this stage, we’re just checking availability. You can find out more on the next screens. We have found multiple lines at the premise. Do you want to migrate this service to Origin? Or would you like us to provide a new line at the premise? We need your landline number so we can identify which line to migrate. We have found a line that can be taken over. Do you want to takeover this service to Origin? Would you like to retain your current phone number? Unfortunately we cannot port your current number to Origin. We would need to provide you a new number and you would lose your current number. Is this okay? When querying our suppliers they have informed us that your number cannot be ported over but we are going to try our best to find a solution for this. We can't guarantee being able to keep your number but we will keep you informed of progress. Your right to cancel will still be honoured if we cannot port your number. We cannot find a line at your premise to migrate. We will provide a new line at your chosen premise. Our systems show that fibre may not be available in your area yet. If you think fibre is available (or if you already have fibre), let us know. Alternatively, you can order our great value Unlimited Origin Broadband package, and we'll be able to switch you over to fibre as soon as it's been installed in your area. If you need any more information please just get in touch. 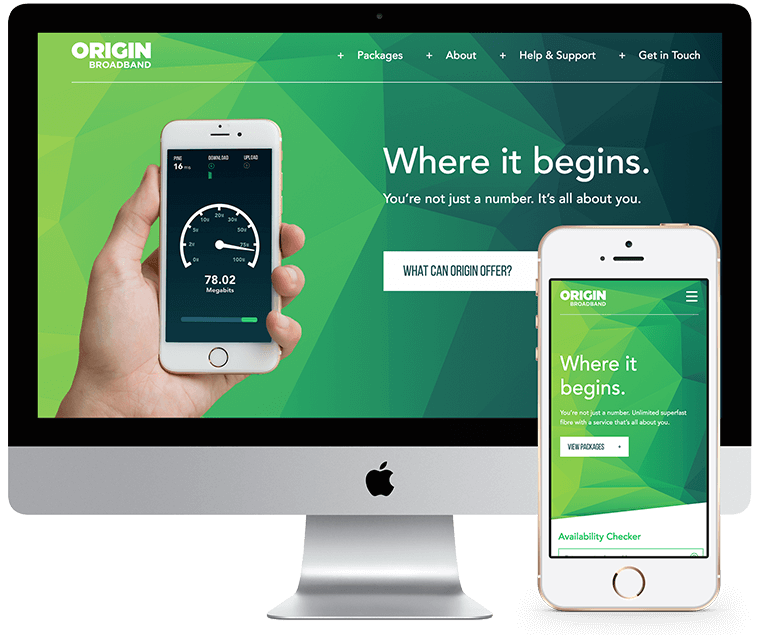 Origin Broadband & Line Rental. Completely unlimited broadband, perfect for browsing the web, watching videos, and keeping in touch. Origin Fibre & Line Rental. Amazing value fibre optic broadband for all the family - great for streaming your favourite films and TV shows. Origin Max & Line Rental. Our best value family broadband package - ideal for gaming, streaming, and surfing. Our live chat team are here to help! If you want to upgrade during or after your contract then the 30-month guarantee will not apply, as it is only guaranteed for the contract and package that you took out at that point in time. Everything you need to know about our broadband packages. We won't ever put restrictions on your connection. This means no download limits, no fair usage policy, no traffic shaping, and no blocked websites. We supply all of our customers with a fantastic ASUS wireless modem/router absolutely free of charge, you won't even pay for postage! We use the best equipment to ensure you always receive a great quality service. Our technical know-how helps to keep you online for longer. Take advantage of our unique referral offers and receive a £25 credit to your bill when a friend or family member mentions your name when they join! It's never been easier to switch to Origin - we do all of the work for you. It's so simple to switch from Sky, Plusnet, TalkTalk, BT, or any other provider! No MAC key, no back-and-forth, and absolutely no hassle. Once you choose the package that's right for you, our transfer team will arrange everything with your previous supplier, send out a brand new router, and keep you informed as your order progresses. Everyone is different. If you&apos;d rather have an e-mail, phone call or text message to keep you up to date, we&apos;re happy to help. If you require all three, that&apos;s fine too!